It never occurred to me to make up a fictional town for my Shakespeare in the Vineyard mystery series, just as it never occurred to me to write other than in third person. Both felt natural. When our daughter moved to Ashland, Oregon, I attended lots of plays at Oregon’s Shakespeare Festival and got the idea to bring Shakespeare to the Livermore Valley. It was that easy. I modeled my Elizabethan outdoor theater and small indoor Blackfriars theater after theirs, but on a much smaller scale. But it wasn’t an original idea. 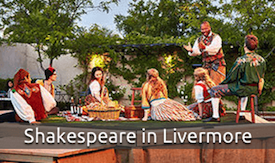 The “real” Livermore Shakespeare Festival is produced under the stars at Concannon Winery in Livermore, CA. 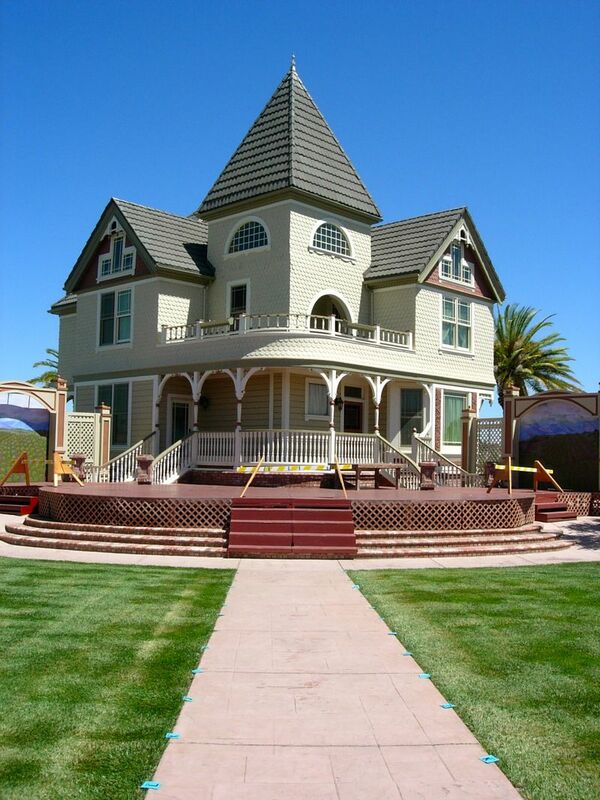 Patrons arrive early to picnic on the vineyard grounds, then bring their wine into the seating area to experience Shakespeare and other great plays in front of the Queen-Anne style Victorian home that was moved to the center of the winery in 2008. Inspired by William Shakespeare, Livermore Shakes is committed to producing professional theater in the community. They produce and support theatrical events and create a company that is accessible and integrated with the Tri-Valley community. They believe the desire to create and celebrate a rich, vibrant community is a core value shared by the residents and businesses of the Tri-Valley Area. I drove around Livermore and toured some of the wineries before deciding to set my fictitious Shakespeare festival on the eastern edge of town and on top of a hill. But setting my series in a real town can present problems. On the positive side, my book sales reflect readers who like to read stories that take place in their town, and I’ve been invited to talk at their book clubs. Livermore Shakes also invited me to sell my books at their plays. The only negative is that local readers recognize mistakes and will call you on it. So far, I’ve lucked out. Maybe because I’m a Livermore police volunteer and they assume I know more about police procedures than I do. Five Star, my publisher, required written permission for me to set a scene in the Livermore Police station because it’s a real place. The police chief asked the city attorney to write a letter to Five Star granting me permission to use the interview room in the station, providing I didn’t say anything negative about the city or the police department. My advice on using a real place for your story is to keep it real and, if it’s a series, it’s too late to change book two or three to a fictitious town because it’s more convenient. In book three of my series, I’m taking Cait Pepper to Santa Cruz, another real town, in her search for a drug dealer who is threatening Cait’s friend and her husband who recently bought a winery in Livermore. With the advent of each New Year and a fresh new calendar, I reflect back over achievements, disappointments, or goals I set and procrastinated about. 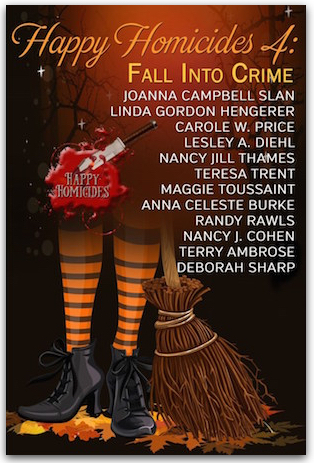 This year, two achievements stand out: I received a contract for Sour Grapes, the second book in my Shakespeare in the Vineyard mystery series. It will come out in 2014. I also managed to hike the Pinnacles for the third time. It gets harder with each passing year. My readers always want to know how long I’ve been writing, so I thought this might be a good place to reflect back thirteen years to when it started. That’s peanuts to those who have been writing all their lives, but better late than never. I’ve always read, mostly comic books as a kid, but still about places I wanted to be, some fantasyland where the world appeared perfect. When I retired from Sandia National Labs in 1998, and then again in 2000 as a DOE contractor, murder never entered my mind except in the mysteries I loved to read. I attended Penny Warner’s book signing, later joined her critique group, and wrote my first novel set on Martha’s Vineyard. Updating that book and hopefully seeing it in print one day, is one of my goals for 2014. When I started writing, I struggled to perfect my work before showing it to my critique group, Which now I realize was a mistake. Just write it and edit it later. Typing “The End” on a piece of work you’ve written, is a great achievement. Never let anyone tell you you lack the skills to write a novel. 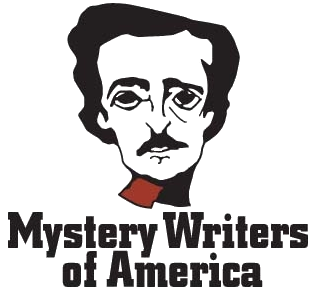 This past November, my library offered a host of support services for National Novel Writing Month, or NaNoWriMo as it’s known. It was jump-started with a kick-off on October 30. I was part of the panel with three other authors. We discussed how to get started on a novel and how to weather the ups and downs of the creative writing process. In the audience was a young boy (he was 12) who shared a negative response he’d received during class from his teacher. He was told he would never be a writer and that he should find another passion. Yet there he was, willing to devote time to write a book in one month. Ashland is located in the south end of Rogue Valley and is the home of Southern Oregon University (where daughter Carla graduated from and where Ann’s daughter Devon currently attends). Some people need their coffee fix; I need my Lithia Park fix. It’s a beautiful and diverse park right in the middle of Ashland. Almost one hundred acres of forested canyon-land around Ashland Creek stretch from the downtown plaza toward its headwaters near Mount Ashland. It’s a great place to spend time between plays. There are many fine places to stay in Ashland, but we chose Anne Hathaway’s B&B because it’s in walking distance of downtown and the theaters. A little on the pricey side, but well worth it. Included in our package were tickets, at seventy percent off, to My Fair Lady and the best seats in the house. We also saw King Lear, a contemporary approach to capture what it means to be an aging parent. I’ve always said you can find the most unexpected pleasures off the beaten path. Explore Ashland beyond Main Street and experience art amid the history of the Railroad District. Discover unique galleries and artist studios, inns, cafes, music, a railroad museum, and even a metaphysical center near where a grand station once received passengers from distant cities. I thought it would be a good idea to address some of the questions I’ve been asked about my writing process, where I get my ideas, plotting, and research. Unlike a lot of authors, I start with location. 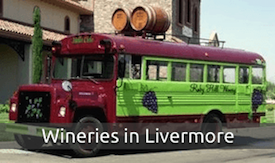 Twisted Vines, the first in my Shakespeare in the Vineyard mystery series, takes place in a real town—Livermore, California, wine country, a colorful location for murder. Why Shakespeare? When my daughter lived in Ashland, Oregon, home of the Oregon Shakespeare Festival, I attended several plays and fell in love all over again with the Bard. Why not bring Shakespeare to Livermore, create my own fictional theaters and vineyard, and set the scene for murder? I give a lot of thought to all of my characters, particularly Caitlyn Pepper, my main character in this series. I begin by exploring her background; she had to be from Columbus, Ohio, my hometown. What are her secrets? Does she have issues she’s dealing with? What’s her profession? Who are her friends and business associates? How can I transplant Cait from city life in Ohio to a small town in California? I’m driven to uncover additional tidbits that might influence the story, and toss stones at her to see her reaction. Once I answer these questions, I have my plot . . . but not enough yet to write a synopsis. I’ve tried outlining, but find myself going off in too many directions. A different murderer than the one I intended shows up, often for the better. I love it when I’m asked about research. In 2003 I went through Livermore’s Citizen Police Academy to better understand police procedures. In those fourteen weeks, we learned about search and seizure and the justice system, ethics and internal affairs, range training, SWAT, K-9 demonstrations, narcotics, crime prevention, juvenile law, and much more. I’m still an active volunteer and have a “regular” job tagging abandoned vehicles. I love role-playing with SWAT. I’ve been handcuffed, shot at with rubber bullets and paint pellets, and tossed to the ground. My research is great fun! Another frequent question: What scenes are hardest to write? I assumed it would be romantic scenes, but, surprisingly, I find them to be the easiest. Words seem to flow from my fingers. But I cheat a little. I put on a romantic CD to set the mood. When the “moment” comes, I close the door and leave the rest up to the reader’s imagination. Do you have a question? I promise to reply. In 1985, George Burns made a generous gift to establish the George Burns Intensive Care Unit at the Motion Picture & Television Hospital. He continued his care and compassion through a living trust. It is the benevolent spirit of Mr. Burns that the Motion Picture & Television Fund honors. George Burns’s dedication to the human condition of those in his beloved “show business” is memorialized through the George Burns Legacy Society. There is a lot to learn from what these famous people have been able to create. “Ordinary” people are also outstanding models of the creative process. With imagination, courage, and commitment, we can rise above doubt, fear, and insecurity to achieve extraordinary levels of personal fulfillment. 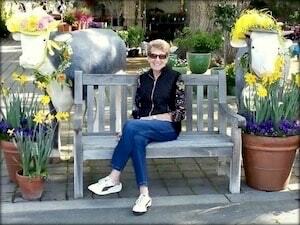 My mother, Corelli Watermon, left a legacy through her music. A professional violinist and singer, she graduated from the Harrisburg Conservatory of Music. How about a legacy of habit? Whatever we do on a regular basis has potential for becoming a “habit” or legacy. For some, eating fast food on a daily basis can be the habit. Others might only make everything from scratch. We all need to be aware that we are teaching our children by our example. Or a legacy of health? Many people’s ideas of what is “healthy” vary drastically. If you never exercise, your children are most likely not going to envision themselves exercising as an adult. This kind of legacy can be dangerous to their health and to ours. I think of myself as a work in progress, especially in this area of my life. One of the Legacies I’m most passionate about is Work Ethic. I want to leave a legacy of strong work ethic, which ultimately comes from having a vision for what you are accomplishing and an innate drive to compel you to take action and get it done. I personally believe that work ethic is not something that is taught, but modeled, like the love for reading or writing. What are some practical ways you can leave a legacy?